Well I have some sad news. A member of the family passed away this week. My little buddy, Gill, now sleeps with the fishes. I was trying to figure out how old he was … probably 6 years old. I say that was a good life for a goldfish. It was nice the way he went though, the usual routine when I came home – he was napping, then he stirred and started flipping his fins, getting all excited as usual and making the fish faces. I did notice he was a little slow though, so I danced with him for a while. Yes, that’s right. Gill liked to move to the music. He was particularly fond of the jazz, MMW, and sometimes a little Dave Matthews. Well … we were having good times together, dancing … and making a few fish faces. He will be missed. He certainly was a trooper, with me through clean tanks and not-so-clean tanks, and he was always a gentleman to the ladies. Attached is a photo from about a year ago. 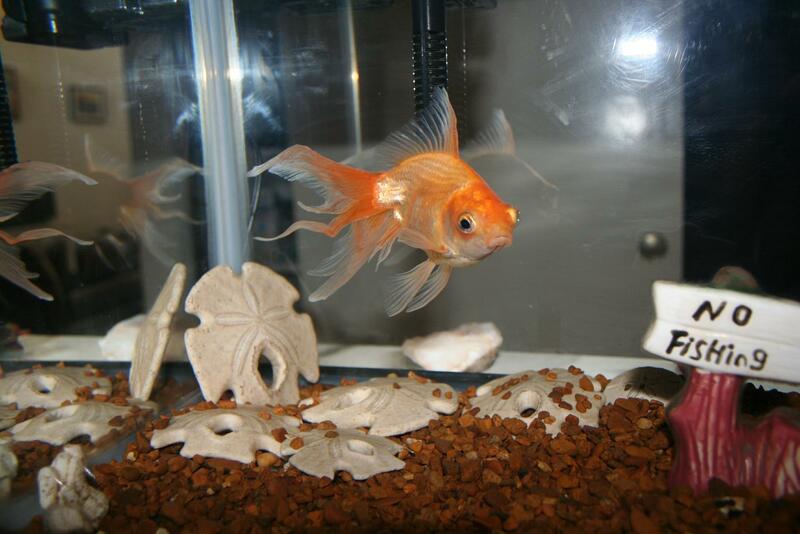 He looks sad is this picture but Gill was the happiest and most personable goldfish I ever met. He was a charmer. I never could get him to smile for the camera though. He was always so modest. Ps. I hope you all take a moment today to grab a friend, dance and make fish faces. You feel better and make someone smile too.